If one of your surgical hair restoration goals is to obtain moderate coverage over a particular area of less than about 180 square centimeters (about 1 ½ times the area of a standard music CD), you could quite possibly find happiness in surgical hair restoration. An average donor area will have about 80 follicular units per square centimeter. The size of an average donor area (back of scalp) can be as large as 200 square centimeters. Many factors are responsible for successful surgical hair restoration. Proper placement of follicular unit grafts and consistent balancing of hair densities allow for the transplantation of your hair to appear natural-looking. The illusion of fullness from a surgical procedure can generally depend on your unique physical characteristics, follicular unit density, and hair density. Density equals the number of follicular unit grafts over a given area (Density=Follicular units/Area). If you are a Norwood six patient, you could have about 300 square centimeters of baldness on your scalp. 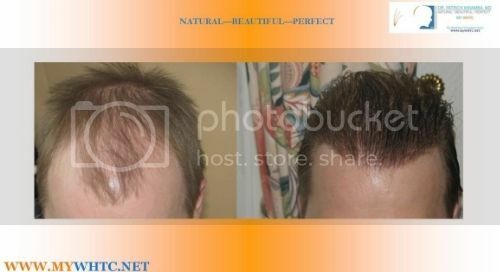 To attempt to adequately treat this pattern of male pattern baldness, the majority of a recipient area may require over 6000 grafts. The strength of your donor area will dictate how much hair loss you can effectively treat. For this reason, not all individuals are candidates for surgery, but each case is unique. The limitations of surgery only allow the surgeon to have an ability to create the illusion of coverage. Not every hair transplant patient can attain full coverage. In cases of advanced hair loss, full coverage is not a reasonable result. A patient’s goal may be achievable if the expectations are realistic. Some patients can be entirely happy with the results from a single procedure. On the other hand, you may well find yourself at the cusp of achieving your primary long-term goal. At this point, you may quite possibly alter your perception of uniquely defined happiness by adopting more artfully intricate surgical hair restoration goals. Once you decide to make the move to pursue the surgical solution for you, remember to question every aspect and step of the entire surgical process. By all means, practice due diligence and attend more than one consultation for good investigative measure of such a life-changing process. Remember, not all well-known clinics operate as methodical experts in the field of hair transplantation. It is your responsibility as a patient to know the skill set and degree of artistry possessed by your chosen physician. The irrefutable evidence that separates the best surgeons is the consistency of producing aesthetically pleasing, natural-looking results. Comfortably making an informed decision about surgical hair restoration through in-depth consultation with your prospective hair transplant physician should minimize the probability of the occurrence of any physical and psychological trauma associated with extensive donor scarring, mismanagement of donor resources, and waste of hard-earned financial resources. During consultation, take an appropriate amount of time to discuss your hopes, concerns, and prioritized goals for hair restoration. Carefully verbalize your defined goal to ensure you clearly communicate your most ideal coverage, ideal density, and hairline design for appropriate balancing of facial features. Being thoroughly educated on the causes of hair loss, understanding the progressive nature of hair loss, and knowing the limitations of today’s surgical hair restoration methods can provide you with the necessary tools to readily identify and recognize the most commonly made mistakes and pitfalls associated with undergoing hair transplant surgery. There are no specific dates, it just says Saturdays. Is Dr. Mwamba in London every Saturday? Our customer care department looks forward to hearing from you. Thanks for your message.